“Do you know that for every hour you sit down, your life expectancy decreases by two hours? For comparison, every cigarette smoked reduces life expectancy by 11 minutes,” Dr. James Levine. Dr. Levine is the co-director of the Mayo Clinic and the Arizona State University Obesity Initiative. He is the author of the book Get Up! Why Your Chair Is Killing You and What You Can Do About It. There are some 10,000 publications having shown that sitting is harmful to your health, regardless of other lifestyle habits. What does this mean? It means sitting down is far more hazardous to your health than smoking. I think that’s a bit shocking wouldn’t you say? What is one to do? Well there is the option of standing at your desk to do your work. I know when I am having an office day and am tired of sitting; I take my laptop and go to my kitchen counter to stand while I’m working. Really feels good to me. But some people do not have that option. So the next best option would be to get a Standing Desk. The standing desk is not new. In the 15th century, Leonardo da Vinci used one. Other famous users include Thomas Jefferson, Benjamin Franklin, Winston Churchill and Ernest Hemingway. The current popularity of the standing desk is related to long working hours, the need for a comfortable way of working, and even more, to the health benefits that are made possible by the use of one. A standing or stand-up desk is simply a desk that allows the user to remain comfortable while standing and working. 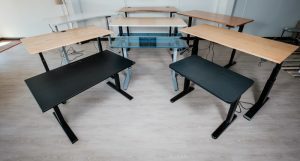 A lot of standing desks are height adjustable (sit-stand desks), so that the user can alternate between standing and sitting throughout the workday, which is the advisable way to get the most benefits from this change. The popular phrase, “Sitting is the new smoking” strongly underlines the fact that sitting for hours at a time is known to be unhealthy. Although exercise is the best way to burn calories rapidly, standing instead of sitting increases the number of calories you burn by 170 calories daily – which adds up to a whopping 1000 calories a week. Most people are familiar with the after lunch blood sugar spike and subsequent crash into fatigue. Standing rather than sitting at a desk can significantly lower the blood sugar spike, as can alternating sitting and standing every half-hour. This is particularly important for people who develop insulin resistance or type 2 diabetes. Increased heart health was linked to standing in 1953, when a study of bus conductors showed that the conductors who stood all day had only half the risk of dying from heart disease as the conductors who remained in the driver’s seat for the same amount of time. Since then it has been suggested that even intense exercise cannot counteract the negative impact of remaining seated all day. If back pain has developed from long periods of sitting, then the standing desk can help reverse the problem and bring the sufferer the relief they need. One study showed that workers suffering from lower back pain found their pain reduced by 32% after a few weeks of substituting a standing desk for a sitting one. Another study published by the CDC found that using a sit-stand desk reduced neck and upper back pain by over 50% in just two weeks. In an interesting find, a seven week study found that workers who used standing desks felt less tired and stressed than those who sat the entire day at work. Over 80% of the people using standing desks claimed increased energy during the workday. This combination of increased energy and better moods correlates to mental health studies that have linked sedentary time with increased risks of depression and anxiety. Because of the established connection between sedentary time and both heart disease and type 2 diabetes, (as well as obesity and cancer), it’s not surprising that studies are linking sitting time to an earlier death. An American study from 2012 concluded that the average person’s life expectancy would be two years longer if he or she cut down on sitting time to three hours per day. Even if “sitting is the new smoking” is a dramatic way of getting the point across, the point is well taken. While anyone switching to a sit-stand desk is advised to adapt to this new routine slowly, the benefits gained from changing the physical way you work can have a very positive impact on your health and longevity. So how to do you being to find the right standing desk for you? Here is a thorough review of standing desks to help you pick your own. Is your office efficient and are you productive in your workday or do you have to rifle through clutter and piles to start the day off? Contact me for an Office Assessment. I will evaluate your workflow, your “prime real estate” and design a plan to help your day be productive and effective. Standing desk does burn more calories than a conventional desk, but to really see optimal health benefits make sure you are walking throughout the workday. Great info on the health benefits of standing during the day. I recently got a standing desk at work and already feel better and more energized at the end of the day. I agree with your comment about walking throughout the day. Good advice. I set a timer for 30 mins, and use it to prompt me to walk away from the desk for a minute or so.